Surprisingly, Bulls players were not huddled around the radio late Friday night after the dispiriting 91-74 loss to the Portland Trail Blazers. Joakim Noah, who had 11 points, 10 rebounds and six assists, sat for a long time in his locker stall staring ahead. Jimmy Butler quietly picked at his cell phone. Taj Gibson dressed quickly, pulled on a bright white Los Angeles Dodgers uniform top and excited the locker room. Yes, even before the Knicks game with the Phoenix Suns ended. Had the Bulls defeated the Trail Blazers, the Bulls would have clinched a playoff spot. So, instead, they had to wait out the Knicks’ result. No one did. Perhaps they couldn’t find a radio. Perhaps no one knew what a radio is. Break out the official playoff hats and t-shirts. That’s $19.95 each and get your orders in. The Bulls are going to the NBA playoffs! OK, maybe it’s not a big story with the Bulls now 40-32 after the loss to the Trail Blazers and the recent stretch that has seen them rank among the best teams in the NBA the last three months. So the discussion had become all about seeding, a potential first round playoff matchup and whether it’s better to face the Pacers or Heat in the second round. The Bulls, as Noah noted, didn’t have much in being shot down, figuratively, and literally shot out of the arena as the Trail Blazers were 10 of 22 on threes to three of 17 for the Bulls. Though the Bulls had three players with double figure rebounds, it wasn’t difficult with so many missed shots. Mike Dunleavy and Kirk Hinrich were a combined one of 15 shooting. And the Bulls still were outrebounded as the Trail Blazers, playing a fourth game in five days on the road with the Bulls having three off days, led except for the first few minutes, by double digits the entire second half after a 15-2 third quarter start and by as much as 24 into the third quarter. And though making the playoff has been taken for granted for weeks, it wasn’t after the last time the Bulls played the Trail Blazers, back in late November when Derrick Rose suffered his season ending knee injury. The Bulls then went into a month long dive that saw them lose 11 of their next 14 games. The sentiment in the community seemed overwhelming to effectively throw the season, to purposely lose for a draft pick. Then just as the Bulls were beginning to recover with five wins in their next seven games to get within four games of .500, the team traded the popular Luol Deng, who’d emerged as the team’s leading scorer in Rose’s absence. The Bulls got 10 points and eight rebounds from Boozer in the first quarter. There are not many teams that can survive losing their two top scorers, and in that fashion. It did seem, to many, like the team was giving up. No one would have blamed them at that time. And, in fact, few believed the Bulls were a playoff team any longer. Rumors swirled of multiple players being dumped for draft picks. Questions circulated among even the players about whether all the work was worth it with everything going on around them. But coach Tom Thibodeau never wavered, that this was a team that could and would compete. And the character of the players would not allow them to give less than their best no matter what anyone else believed or suggested. The rest is in the results. The Bulls got back to .500 with an overtime win over the Lakers Jan. 20, won in San Antonio to open their Western Conference trip, stumbled a bit and then won 16 of the next 23 with Friday’s loss. That included wins over the Heat, Pacers, Nets, Raptors, Rockets, Mavericks and Warriors and overall nine of 15 wins over playoff teams. That’s a strong playoff statement for a team that was a questionable playoff team a few months into the season. They didn’t care to celebrate Friday. But the Bulls could have. There are no banners for it and not much acknowledgment. But it does mean something for this team and all it’s endured this season. The Bulls Friday just got outplayed by a more desperate team. The Trail Blazers, 47-27, had suddenly been in danger of falling out of the playoffs after being one of the biggest stories of the first half of the season. They started 22-4 to lead the West and there was title talk in Portland. By last week losing the first three on an Eastern trip, they’d fallen within two games of ninth place in the West. But they got LaMarcus Aldridge back from injury, won in Atlanta Thursday and then dominated a not so desperate Bulls team Friday. It was more than that. The Bulls got 10 points and eight rebounds from Carlos Boozer in the first quarter and Noah dribbling all the way for a score as he’d do three of four times in the game for a score or assist. But Portland’s ball movement was sharp, emphasizing moving side to side which few teams can do effectively against the Bulls. Portland also is a good team in transition, and the Bulls were lost in transition too often. The Trail Blazers inched ahead 19-16 after one quarter in the Bulls sort of slower game. But the Trail Blazers surged early in the second quarter with a small lineup featuring shooters around either Aldridge or Robin Lopez, the latter also with five blocks. D.J. 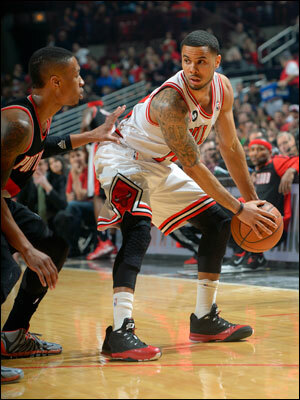 Augustin had 15 points and seven assists with Kirk Hinrich in early foul trouble and playing just 17 minutes. Aldridge had just five points as Noah defended him well, but 13 rebounds. Mo Williams led Portland with 18 points off the bench and slick point guard Damian Lillard had 16 points. But the Bulls were unable to take advantage of their physical presence against the smaller lineups. 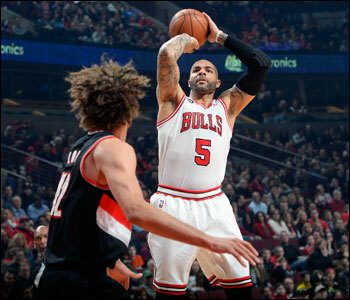 Boozer had 16 points and 12 rebounds and Taj Gibson had 13 points and 10 rebounds. D.J. Augustin had 15 points and seven assists with Kirk Hinrich in early foul trouble and playing just 17 minutes. But the Trail Blazers took advantage of the Bulls big men switching onto guards, which the Bulls usually do well, with excellent three-point shooting. Portland took a 47-36 halftime lead and then blew it apart with Nicolas Batum with a pair of threes and Wesley Matthews with another in the first two and a half minutes of the second half. That left the Bulls behind 60-38, and there wasn’t much recovery from there. 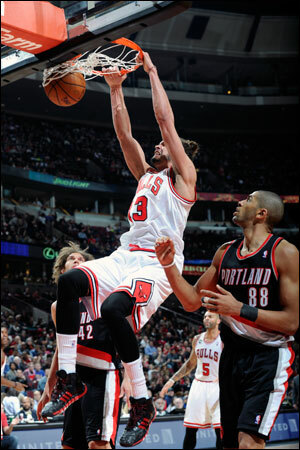 The Bulls did have a spark of effectiveness with an 11-2 run to close the third quarter and trail 73-58 after three. But a Lillard three to open the fourth started a 9-1 Portland run back to a 23-point lead and a soon-to-come appearance from Jimmer Fredette. It wasn’t a night for the Bulls to celebrate. But it was one that did mean something from where they were to where they are.